Actor Jay Hernandez wears a Rolex GMT-Master II in the pilot episode of the new 2018 Magnum P.I. tv series. In the original series from the 1980s, Magnum also wore a Rolex GMT-Master II with Pepsi bezel. The watch has a red and blue bezel (the 'Pepsi' bezel), and a black dial. We can't see yet if the watch is a white gold version or a stainless steel watch or from which year the watch is. We can see the watch in the series doesn't have a jubilee strap, so it's not the new 2018 stainless steel version. Magnum P.I. was a popular television series that ran from 1980-1988, starring Tom Selleck as private investigator Thomas Magnum, famous for driving a red Ferrari 308 GTS. The CBS reboot stars Jay Hernandez as Magnum. The series will once again feature a Ferrari 308 GTS, as well as many other Ferraris. The new Thomas Magnum is an Army veteran who served in Afghanistan and moved to Hawaii to be a private investigator with a group of his friends. The Rolex GMT-Master wristwatch was originally designed in collaboration with Pan American Airways and issued by the airline to their crews on long-haul flights. ("GMT" in the name stands for Greenwich Mean Time also known as Coordinated Universal Time). The original GMT Master watch has a 24-hour display fourth hand complication directly linked to and displaying the same time zone as the standard 12-hour hand. 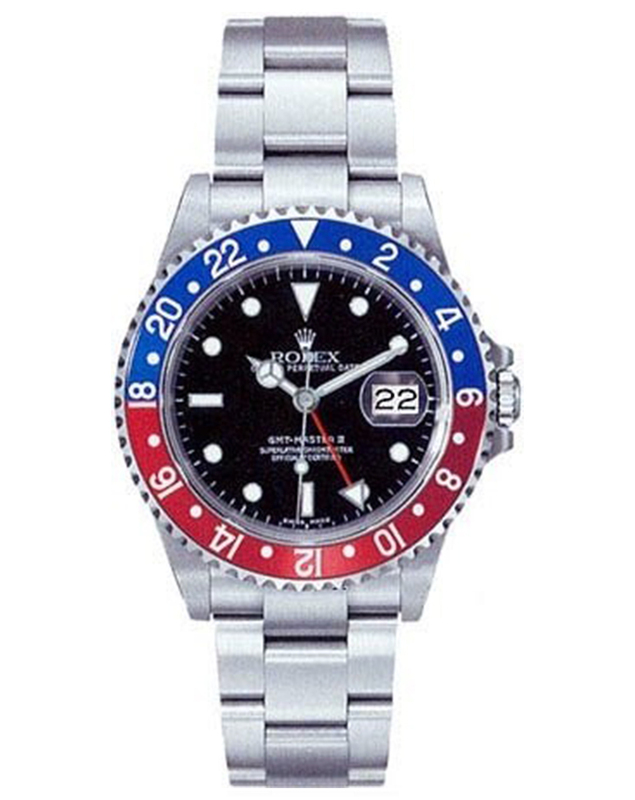 This GMT hand enabled the crews to set the watch to GMT or another time zone, and, using the rotatable 24-hour scale bezel, set to the correct offset, a second time zone could be read. GMT or UTC is the time zone that is required for all aviation planning, weather forecasts, schedules and other paperwork. Jason Bateman wears a Rolex GMT-Master in the movie The Switch (2010) and another GMT is worn by the main character in Street Kings (2008).